Altering the DNA of animal test subjects has never been this easy or fast. Before a new medication or treatment can be tested on humans, it much go through vigorous animal testing, much of which is done using mice. 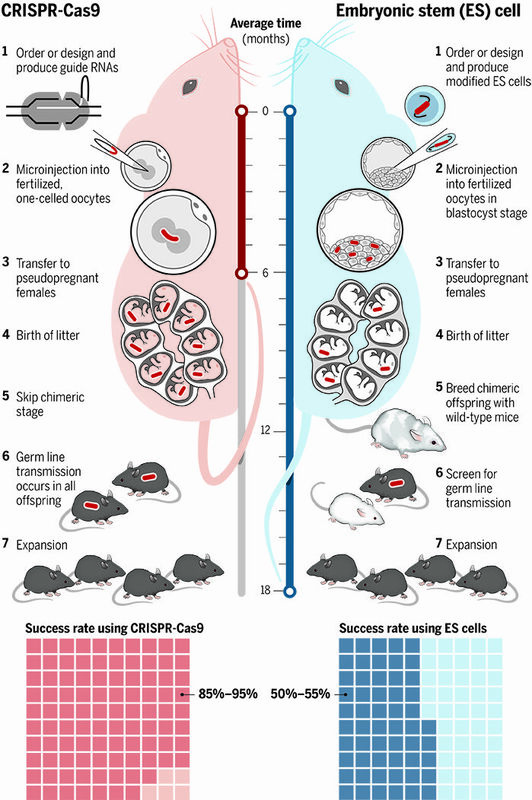 Traditionally, scientists used a time-consuming method of creating genetically modified mice that involved altering the genetic information of embryonic stem cells, injecting the stem cells into embryos, and then letting the mice breed for a few generations. The advent of CRISPR has changed all that. The technology takes advantage of a guide RNA to send an enzyme, usually Cas9, to cut a segment of DNA. The DNA then repairs itself, leading to a genetic mutation. This method skips the breeding process in mice as the edited gene will manifest itself in all of the offspring of the female mouse. It’s not just the speed and efficiency of CRISPR that has scientists talking. Tak Mak, a biochemist from the University of Toronto, states in Science that it’s about 30 percent cheaper to engineer a mouse with CRISPR than with ES cells, bringing his average cost down to about $100,000. This opens up the potential for more labs to adopt this method. Researchers can engineer new strains of mice as soon as they see the need for it, giving them opportunities to pursue research that may have previously been time or cost prohibitive. CRISPR is not without its disadvantages, though. While it is good for crippling or “knocking out” genes, it is not as effective at adding or “knocking in” genes. That makes it harder for engineers to give mice functions and it also prevents them from creating mice with what they call a “conditional” knockout, which would allow the researcher to disable a gene at a certain point in the animal’s life or within specific tissues. Still, Wiles is confident about the potential of CRISPR and sees it playing a huge role in the future of genetics: “There is a massive number of things CRISPR can do that people are just beginning to grasp. We’re really at the very, very early phases of development and the tool has infinite possibilities.” Clearly, making mutant mice is just one of the many uses for this game-changing tech.